But mindfulness for the most part, doesn’t just happen while you stand there. While it sounds simple, you’ll likely notice that the mind likes to take flight. We lose touch with our body, and pretty soon we’re engrossed in obsessive thoughts about the past or fretting about the future. Remaining present and mindful is an ongoing practice. It takes being able to recognize and pull your mind’s focus back into the present moment when it begins to wander off, like it so often does. A major challenge with staying mindful and present in the moment can be the desire to switch off by using technology. Even though we may have the best Zen intentions, we’re constantly surrounded by quick fix distractions, from our televisions, to the Internet, gaming, Ipads, mobile phones and social media. Admittedly, it’s hard to escape it without renouncing all possessions, quitting your day job and moving off grid. 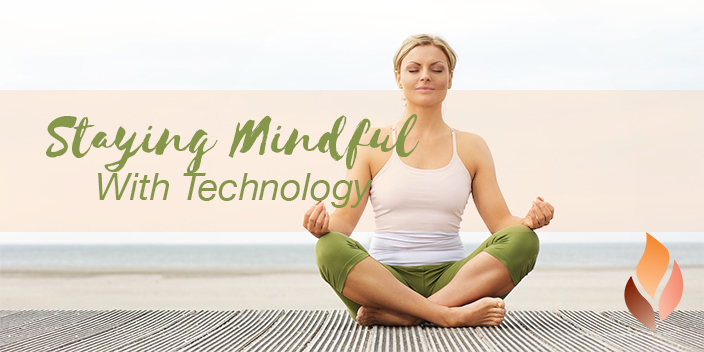 So we’ve found you a few pointers on how you can integrate mindfulness in a technological world. In a world where we feel there are endless things to accomplish and just not enough time, multitasking feels like the answer but it can rob you of one thing, your focus. If you’re sitting down to eat your lunch, try focusing on eating. If you’re folding the laundry, try not to do it in front of the TV. As we give each activity our full loving attention, we start to appreciate each person, each object and everything around us. We also gain a sense of pride and accomplishment in completing tasks. And surprise, you’ll actually find yourself to be more productive! Just like our bodies and our homes our minds need to be cleansed too. Take some time every day to be still; it might be 5mins or 30mins, it doesn’t matter. Spend that time focusing on your posture and your breath and when your mind wanders to thinking, which it will, just gently bring it back to your breath. When you stop listening to your minds constant chatter, you’ll be surprised by what you can really hear. Try going to bed with a book instead of your phone in your hand. This habit will not only allow for you to unwind properly from your day, you’ll also notice how easy you’ll fall asleep without those bright lights staring back at you. When listening to another person, we are often there in body but we are not fully present with them. We’re not truly listening. Instead, we are caught up in our own mind. Next time you’re with a friend, stranger or colleague practice being mindful in conversation. Avoid glancing at your phone, staring at the TV or computer and really focus all of your attention on the other person. You’ll be amazed at the power of listening; it’s an act of love and kindness. People appreciate it deeply when you truly listen to them. As an extra added perk you’ll also find that they’ll listen to you more fully when you speak. If you’d like to work on your mediation practice and staying mindful, join us at our Browns plains and Jindalee studios for our Friday and Sunday evening mediation classes.